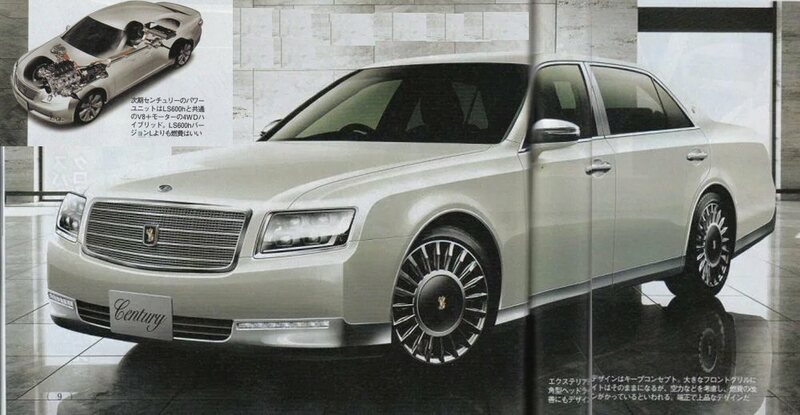 A new Toyota Century (トヨタ・センチュリー) is under development and it should be introduced in Japan next year. Improvements will be made to the 5.0-liter V8 engine (2UR-FSE) and an electric motor will be added. The engine is expected to deliver 394 ps, while the electric motor should deliver 224 ps. Of course, the powertrain will be coupled to a 4WD system. The exterior design will be very close to the FS prototype that was presented back in 2012, a modern evolution of the existing design. The Toyota Century is handmade by skilled craftsmen and it is produced mainly for the Japanese market, serving as Toyota's flagship car within Japan. Production of the Century began in 1967 and the model received only minor changes until a redesign in 1997. So, you can easily understand that its design “represents” Japan. In contrast to other luxurious cars, the Century has not been positioned and marketed as a sign of wealth or excess. Marketing literature states roughly that, "the Century is acquired through persistent work, the kind that is done in a plain but formal suit."